LT Group has invested 2 billion baht to open a “family paradise” for shoppers at the new Harbor Mall Pattaya. Group Managing Director Prakarn Nokohong said the new shopping and entertainment complex aims to provide something for everyone. The mall itself spans more than 100,000 sq. meters in central Pattaya and construction began in 2013. Harbor Mall Pattaya will be unique, offering the atmosphere of a modern shopping mall together with an entertainment center, playground, Tuk Com electronics superstore, office services and other convenient facilities. 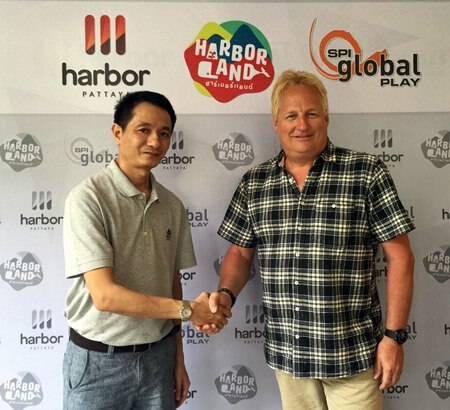 Prakan Hokhong (left), managing director of the LT Group joins hands with Mikael Wettergren (right), senior management of the SPI Global Play AB to help bring the project to fruition. The mall will offer top-brand products as well as a banking center, cafes, and Thai and Western restaurants. 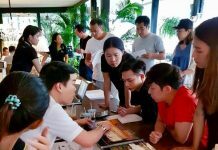 LT Group is aiming to make Harbor Mall Pattaya a popular meeting point for visitors and residents alike. 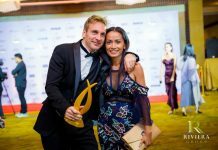 ‘Harbor Land’ plans to be the biggest playground for kids in the Southeast Asia region and will provide sporting facilities, racing zones, video games and much more. The “Rink” will be the first ice skating rink in eastern Thailand and as well as being open to members of the public, there are also plans to stage many shows on ice as well. 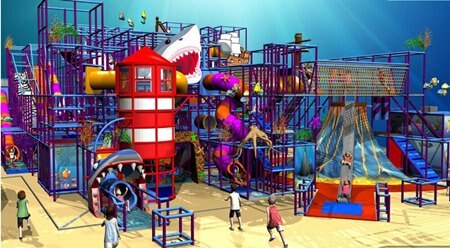 “Kidzoona & Molly Fantasy” is a playground for small children with a concept imported from Japan and will be the largest of its kind in Thailand. 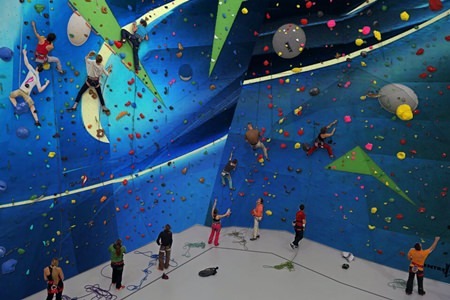 More active adventures can be found at the “Jump XL” trampoline park and ‘“Deep Climbing Gym”, where people who like to rock climb can get an experience like scaling an underwater sea wall. The Harbor Learn & Play area. Meanwhile, mall visitors can escape the outside afternoon heat at “Snow Land”, the biggest snow zone in Thailand. The “Baby Pool” will be available for smaller kids and will be the first in Thailand. “Mario Land” will offer the biggest gaming zone in Pattaya, and the “Harbor Learn & Play” area will be the largest location for education and games in eastern Thailand. The Rink will be the first ice skating rink in eastern Thailand. Harbor Mall Pattaya is a partnership of three major companies, including SPI Global Play AB, headed by Mikael Wettergren; Entre-Prizes Co., which will operate the innovative Interactive Wall Climbing and “Deep Climbing Gym”, and European Leisure Industries headed by Eric Verstappen, which will bring the Jump XL zone to the mall. Deep Climbing Gym will appeal to sports and fitness enthusiasts. Harbour Mall Pattaya is located on Central Road on eight rai of land and managed under the LT Group, which is well-known in the east for its major shopping centers, hotels, offices and leisure facilities. 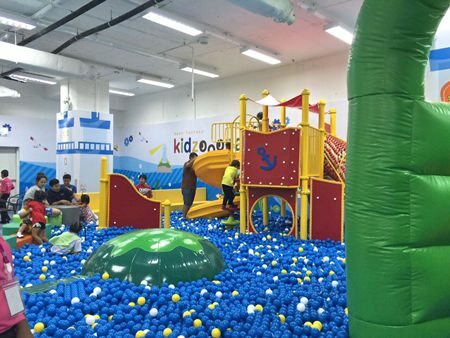 Kidzoona & Molly Fantasy is a playground for small children with a concept imported from Japan. 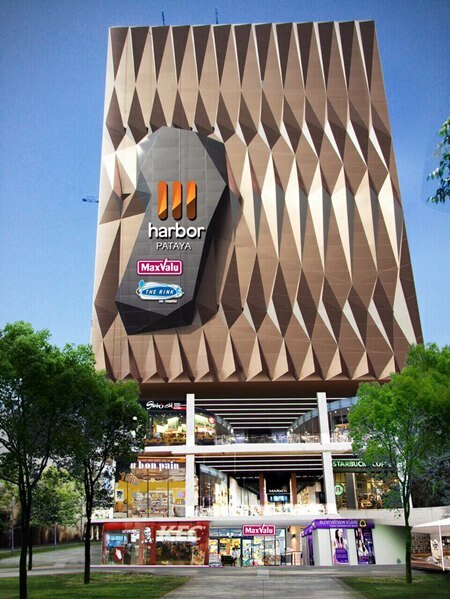 Harbor Mall Pattaya will open its doors soon to provide a whole new experience of indoor shopping and entertainment.